Located in Lugo, Palas de Rey (or Palas de Rei) is a small town that lies a few kilometres from the capital city of Lugo. Palas de Rey is a small, but pretty little town with its main strip being on a road that arcs its way down and around an incline. As a town to live in (or near to), Palas de Rey has all of the local facilities required for modern living with a number of shops and enough bars and cafes for some casual social activity and people watching. The visual high point of Palas de Rey is probably a large and partially canopied square from which much of the rest of the town radiates. 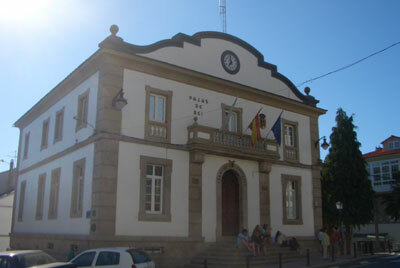 There is also the typical Galician town hall made up from a mix of granite and whitewashed render. You will see similar civic building in nearly every town in the region. For visitors to this part of the province, Palas de Rey is most likely to be a drinks or tapas stop on route to or from Lugo city, but it is also ideally placed to explore the beauty and countryside of Lugo province, its forests and rivers. Unlike la Coruna and Pontevedra, where large towns and cities are never far away, Lugo sees much more in the way of small towns like Palas de Rey, and this little hive of activity is typical of semi rural life in Lugo and the localities in which its population live and socialise. 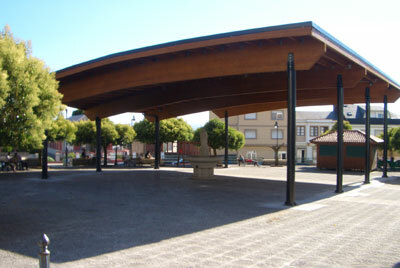 Left, the cover square which is one of the towns newer features. 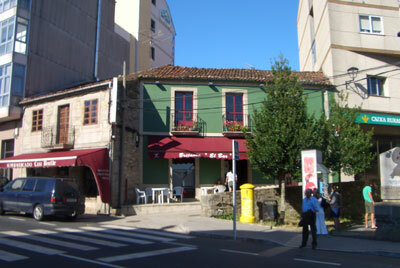 Right, the town hall, typical of many in Galicia and Lugo.